As the world population continues to expand everyday, one of the main question of today’s researchers is to find new ecological and sustainable solutions to feed everyone. 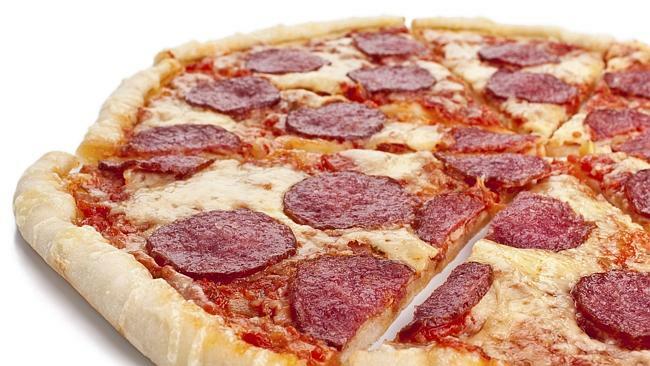 In big cities, most of the food come generally from the outskirts of their territory. Having little space or even none at all, urban zones cannot produce their own food and rely their food stock on productions outside of their active territory. Therefore, the system is mostly based on peripheral to central relation that consists mainly on feeding the large number of population concentrated in the central or in the city itself. DICKSON DESPOMMIER, an american professor of microbiology and public health, has proposed a solution concerning this matter : THE VERTICAL FARM CONCEPT. 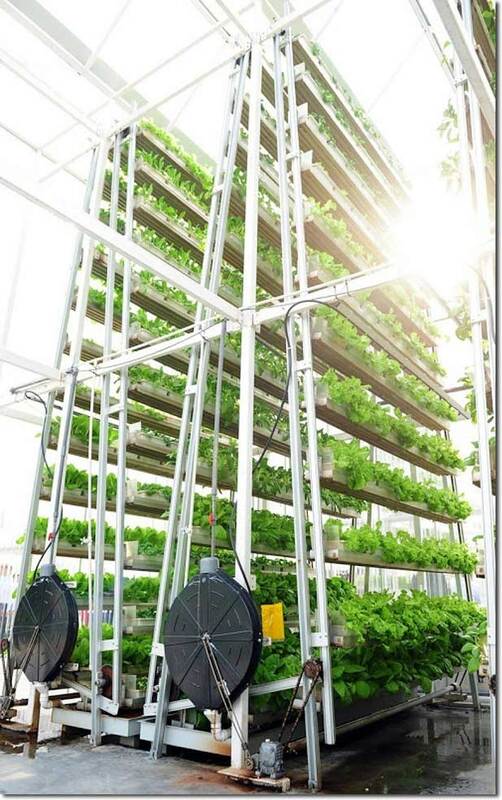 The Vertical Farm consists of cultivating plants mainly for human consumption such as vegetables within a skyscraper or on a vertically inclined surface, hence the name. The concept is almost similar to glass houses which captures the optimal natural sunlight. The use of artificial lightning is also possible to accelerate the growth of the plants and to modify their properties according to different dietary preferences. 1. Vertical surfaces are more suited for the lack of space in urban cities. 2. Producing food IN the urban zone reduces pollution related to transportation, food waste, etc. 3. Vertical Farms permit to produce various types of food in a small surface and therefore can satisfy different needs of the population. Tell us your opinion about this farm of the future ! Brilliant ideas like this one is important in times like ours where the main goal is keeping up with the population growth by maintaining a good environmental level. Shanghai Metal Corporation shares this vision and wants you to spread innovations like Vertical farming and sustainability. As representatives of the metal industry, Shanghai Metal Corporation is one of the leading businesses in the manufacturing of metal quality products in the global field. 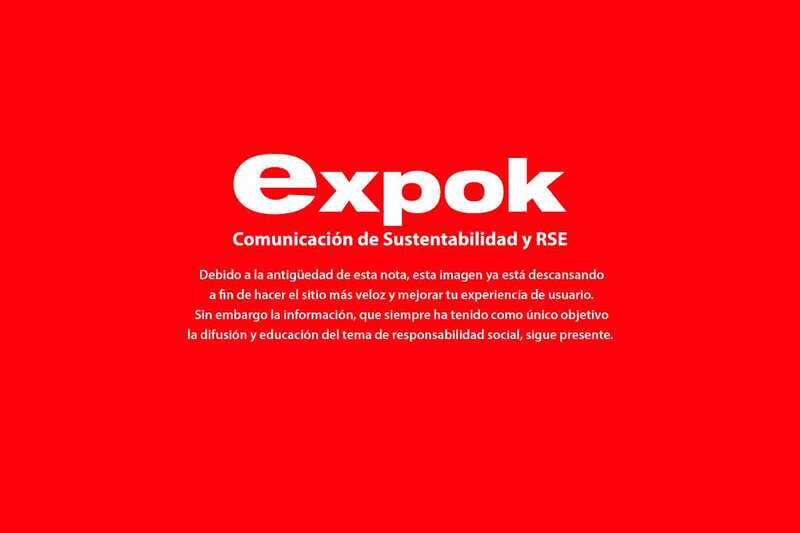 As a major producer of metal related products and reliable services, our most important value is to promote environmental sustainability. In some countries a people’s living space has been becoming smaller and smaller. There might be few reasons : overpopulated city, too expensive rents, enjoying tiny minimalist architecture and design and many others. Probably the smallest parts of our homes are bathrooms and we want to save space as much as we can. 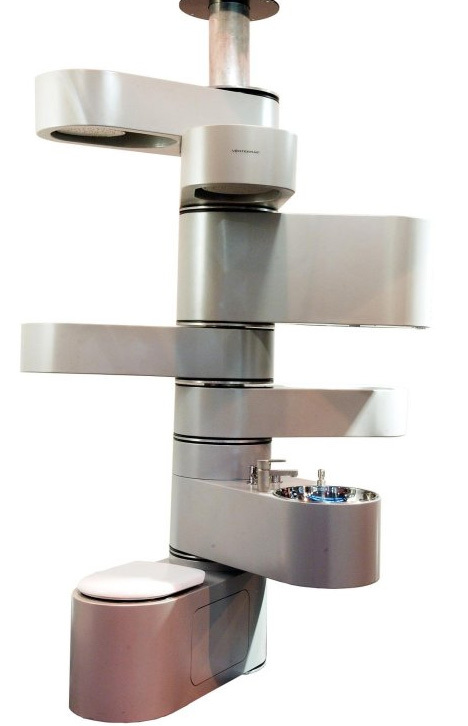 This vertical stainless steel bathroom full of secret shelves, toilet and even shower looks a bit like a space ship bathroom, right from the future! “The Vertebrae” was designed by Paul Hernon and he got inspired mostly from functional modern architecture and from our own natural spinal system. Each level of series independently rotating vertebrae serves for different needs. Toilet with side compartments, sink and basin, storage spaces and a shower with pull-out shower heads. All of these components can be folded up when not in use. This design idea is not just for luxury hotels or offices to impress their customers but it is mostly a space-saving tactic for tiny personal apartments or condo bathrooms with no room for all of these amenities. Stainless steel gives it a futuristic look with a clean and modern feeling. Shanghai Metal Corporation sells high-quality stainless steel, aluminium and other metal products used for many applications. Visit our main website for more information or send us inquiry and English speaking staff will help you to choose the most suitable product for you. Download a new application by scanning QR code or follow us on Social Media. As shipping containers are getting more and more applications from skate parks to swimming pools, it is becoming very obvious that we haven’t seen everything that these steel crates can do. Now they developing a different kind of shipping container system for military and maritime industry. The Defense Advanced Research Projects Agency (DARPA) is developing a solution that helps organizations providing humanitarian assistance and disaster relief support over broad coastal areas. DARPA’s idea is to use standardized ISO shipping containers that form a platform for emergency helicopters to land. The floating shipping container system also offers accommodation facilities for its crew. The solution will be designed to offer assistance to navy forces by freeing military ships to carry out other military missions. Tactically Expandable Maritime Platform (TEMP) consists of core-support modules that offer all the life support needed by the crew and delivery vehicles. The delivery vehicles, Captive Air Amphibious Transporters (CAAT), utilize air-filled pontoons that make the containers float. The crew will receive its supplies via unmanned air-delivery system. The system has been simulated at the GRASP Lab of the university of Pennsylvania where scientists have demonstrated how the containers utilize GPS to easily assemble a floating platform. It would be interesting to know if the system could be controlled by artificial intelligence distributed with every container. Such system could be implemented with flocking algorithms that makes the containers organize independently just like a flock of birds. Bringing this technology into play could be the next innovational step towards rescuing human lives. As already mentioned, this ambitious project uses ordinary standardized shipping containers. We in Shanghai Metal Corporation provide those containers worldwide. Please visit our website for more information or send us an inquiry. Remember to check our social media sites Twitter, Facebook, LinkedIn and Instagram. Coca Cola Saves Lives with Shipping Containers! One of the world’s most valuable brands Coca-Cola is utilizing shipping containers in its corporate social responsibility program in developing countries within the bottom-of-the-pyramid (BoP) category. Together with Deka R&D and other major investors including UPS and IBM, the beverage company is installing container kiosks that will provide drinkable water for three billion people in the world that suffer from the lack of it. 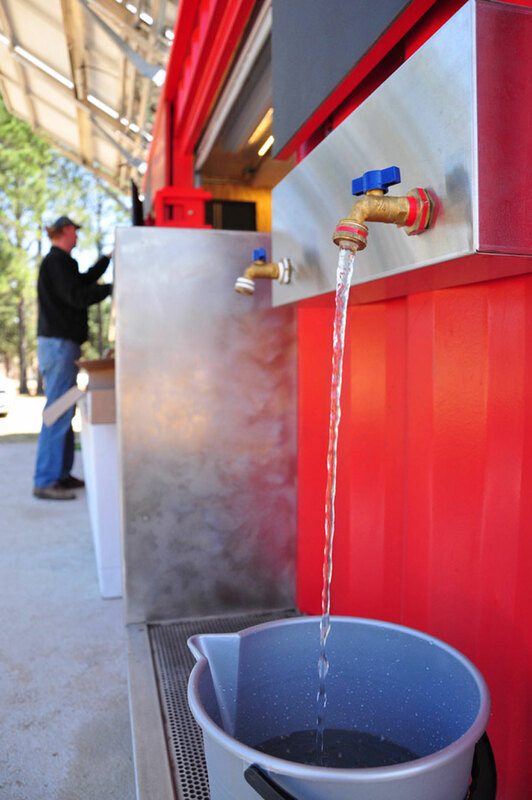 These Ekocenters are to provide purified water for communities that have a limited access to safe drinking water. The modularly designed kiosk is made out of a 20 ft shipping container. The container is empowered with Slingshot technology that is responsible for the purification of water. The kiosk is also meant to generate entrepreneurship in developing countries, especially among women. Along with these kiosks Coca-Cola has also launched their 5by20 program that aims to generate 5 million women entrepreneurs by the year 2020. As discussed in our previous article about container shops, setting a container kiosk is a considerable business also in developed countries. Coca-Cola has redeveloped the concept and is now using the Ekocenters for offering locally tailored mix of products, services and resources that also include sustainable energy, wireless communications, refrigerated vaccination storage, health education, and other functionality to jump-start entrepreneurship opportunities and community development. This CSR project begun in 2013 as Coca-Cola set up its first Ekocenter in South Africa. The company aims to install 1,500 to 2,000 Ekocenters by 2015 in Africa, Asia and the Latin and North America. As shipping containers gain more ways of use, we in Shanghai Metal Corporation are also becoming happier in offering our international customers high-quality standardized shipping containers. For details about our large variety of products, please visit our website or just send us an inquiry and our English speaking staff will contact you. Meanwhile please remember to follow us on Twitter, LinkedIn, Facebook and Instagram. 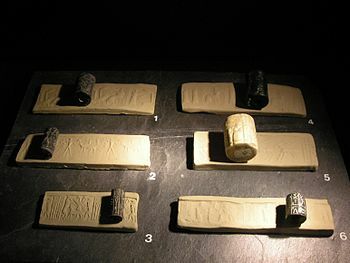 The history of printing goes back to early Mesopotamian civilization before 3000 BC when round seals were used for rolling an impression into clay tablets. It was an amazing and one of the most important inventions in human history. People like reading books, newspapers or magazines and despite the fact that nowadays‘trend is to make everything online and to use just smart phones, tablets or computers, we love to “touch paper” and see impossible things becoming possible. This brings us to 3D printing, “printing future”. For those who are not very familiar with what 3D printing actually is, here is the short explanation. 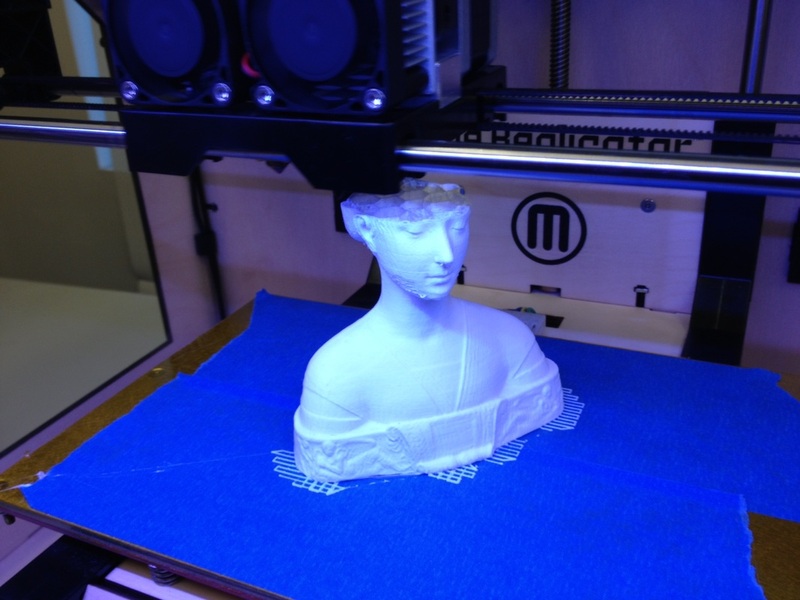 Three-dimensional printing is a method of converting a virtual 3D model into a psychical object. 3D printing is a category of rapid prototyping technology. 3D printers usually work by “printing” successive layers on top of previous to build up a three dimensional object. The idea of printing whatever we have on our minds is attractive. However, the recent surveys found that women and millennial are at least engaged group in 3D printing. In Shanghai Metal Corporation we also offer the printing machines, they are not not 3D but they are still well appreciated by clients for high performance and smooth working. For more information please visit our website or send us an inquiry. Also don‘t hesitate and follow us on Facebook, Twitter, LindkedIn or Instagram. If you have smart phone or tablet, download our new app by scanning QR code. You can also read more articles by this author here. 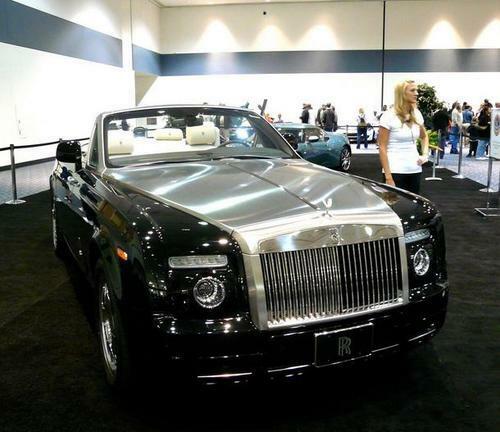 In this day and age, we are surrounded with luxury goods at every corner- from designer clothes, to exotic cars. The problem for some is not the ability to buy something of luxury, but to truly have something unique, something that can’t be seen parked on every street in Beverly Hills-enter stainless steel; a new way to turn heads. Ok, the fact of the matter is that you will indeed turn heads if you buy a normal Lamborghini Murcielago almost everywhere in the world. But a stainless steel Lamborghini Murcielago is what separates you and positions yourself in a separate status quo completely. Perhaps this is not something that everyone dreams off, but to have a beautiful car be transformed into an impermeable work of art due to stainless steels characteristics is something out of a science fiction novel. You might ask yourself why? The answer is quite simple, why not. 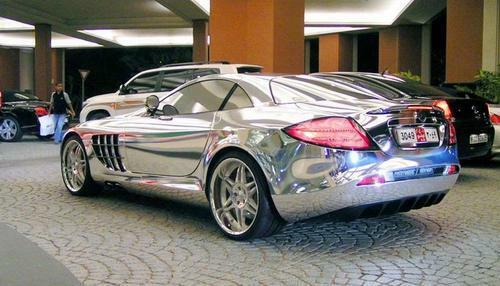 Yes, it may be a bit ostentatious and you will definitely turn heads, but in reality you were going to do that anyway, so why not do it with a bit more shine to it. As a matter-of-fact, these individuals are not just putting a new shine to a luxury item, but reaching for its full potential in automotive performance. With stainless steel having characteristics of temperature resistance, rust, and stain resistance who is to say that this car is probably the only to reach its full top speed due to its temperature resistance and as well perhaps the only car that does not need a car-wash. Luxury is and will always be something that is pushed to the edge; however this edge might not just be flamboyant but in fact beneficial. As Stainless Steel Industry Professional, Shanghai Metal Corporation takes pride in the manufacturing of those products which are used in our customer’s daily life such as stainless steel which our company manufactures and supplies at the highest quality and most affordable price. Perhaps this will be the new approach to luxury, which can only mean one thing-more stainless steel please. 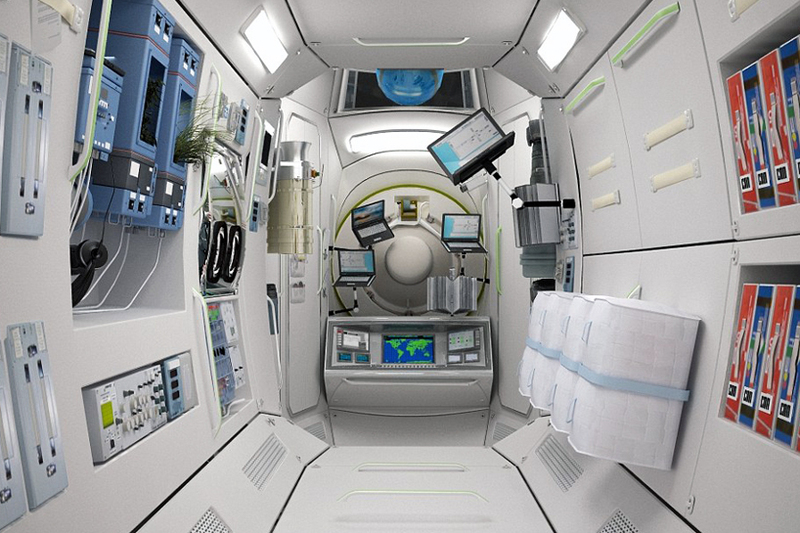 Space tourism is an extreme form of travelling that has been experienced by only a few people. Due to the high prices of such service providers as Richard Branson‘s Virgin Galactic, only the wealthiest can spend a vacation in space. 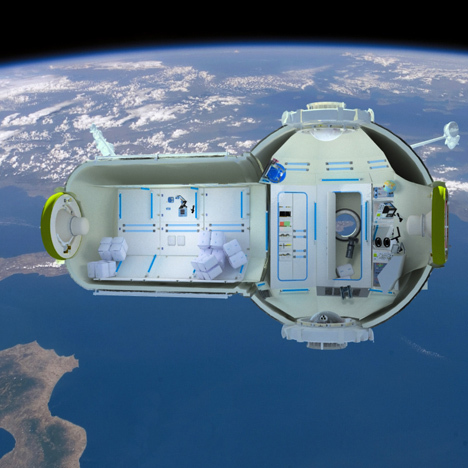 A Russian space pod design company Orbital Technologies is trying to take space tourism more mainstream. An article on Wikipedia has gathered a list of all of the world’s eight space tourists. The lists also showed that in order to get to space, those people spent US 20 to 40 million. Orbital Technologies’ service is much more cheaper. 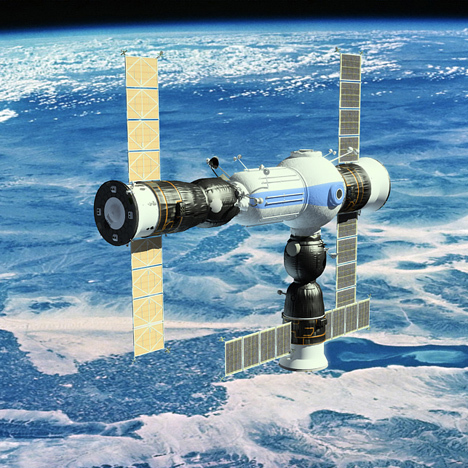 A Soyuz rocket will take you to a two day voyage in space with about $US 826,000. Five nights weight in $US 165,000. 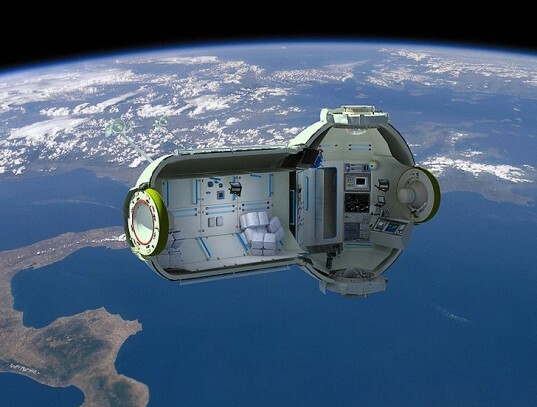 With that price passengers can stay in a comfortable solar-powered Commercial Space Station (CSS) orbiting the Earth within a 217 mile radius. The passengers can view the cosmos through portholes. The price includes luxury gourmet meals that are prepared on Earth. Unfortunately alcohol is not allowed in the space flight. 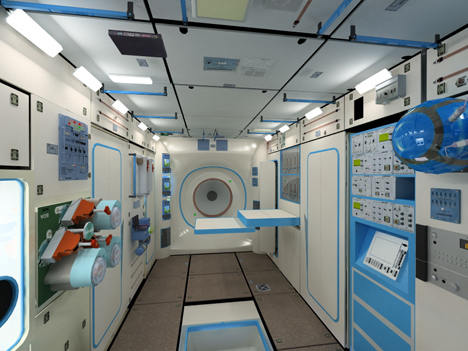 The passengers can use an air-flush toilet and take shower in a fully sealed water cubicle. 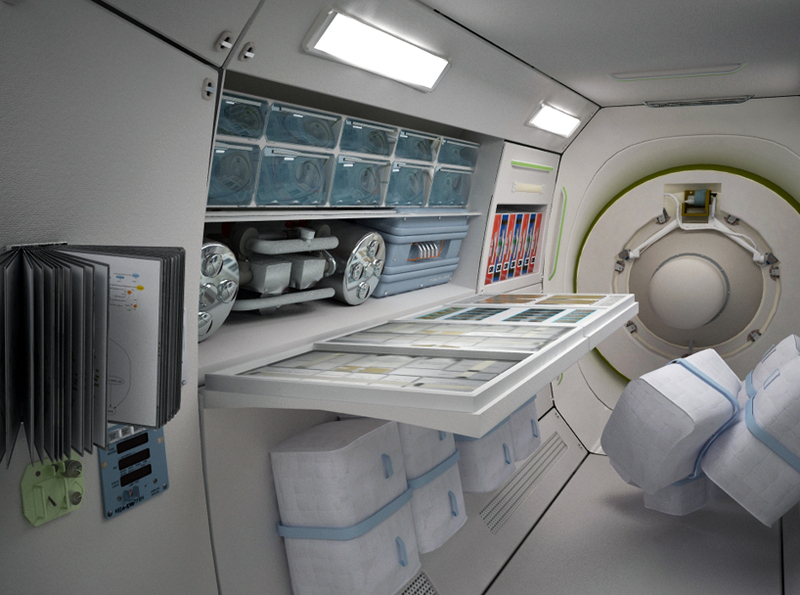 They sleep vertically or horizontally in zippered sleeping bags that prevent them flying around in zero gravity. The galactic prefab is also used as pod for scientific research during off-seasons. It is also used as an emergency stations for space crafts that get into trouble in space. One interesting fact about space tourism is that it slows down aging but just a little bit. According to a theory of time dilation, say, a six month trip to space slows down aging by 0.007 seconds. Thereby arithmetically speaking, a five day voyage in a space hub would slow down aging by 0.002 seconds. 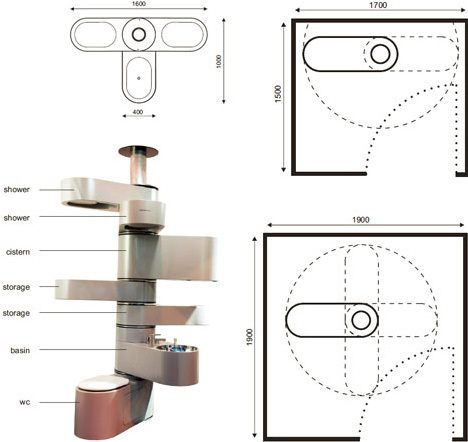 Space pod is a futuristic application of prefabricated building. For many years people have built prefab homes, hotels and hospitals etc. Shanghai Metal Corporation is also a provider of prefabricated building projects. To learn more about our projects, please visit our website. Please also look at our Twitter, Facebook, LinkedIn and Instagram profiles. If you liked this blog, please feel free to share it.